We visited Laos, land of sticky rice, last summer and loved the food there. One of my favourite ever meals was in a cobbled-together ‘restaurant’ by the shore of the Mekong in Luang Prabang. We don’t usually go back to the same place twice but I think we went these about four times due to the beautiful views and amazing food. We would sit by the river at sunset, drinking a Beer Lao and eating steamed fish, pork, chicken and masses of sticky rice. We also loved going to the food stalls on the night market in Luang Prabang, eating barbecued fish and meats and finishing the meal off with some coconut pancakes. 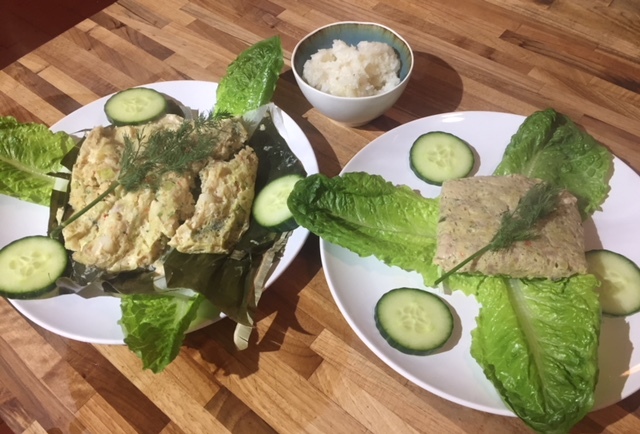 For our Lao meal I tried to re-create the ones we’d eaten by the river, so I set about making Mok Pa – steamed fish, and a pork version along side it. The meat was chopped up and a flavoursome paste of lemon grass, kaffir lime leaf, garlic, shallots, galangal, chilli, fish sauce, dill and spring onion was mixed in. Egg is added for texture and binding. You’re supposed to add rice flour but I didn’t have any in. The mix is heaped onto banana leaves (which I had the in the freezer from China Town in Manchester) and made into parcels. The parcels are then steamed for 30 minutes. Ta da! Not far off the meal we had in Laos, presentation-wise. I still haven’t figured out how to cook sticky rice as beautifully as you get in Asia but it’s not far off from the rice cooker. The mok pa was ok…. but a bit too fishy, probably as a result of the quality of fish I added, but the pork was delicious.